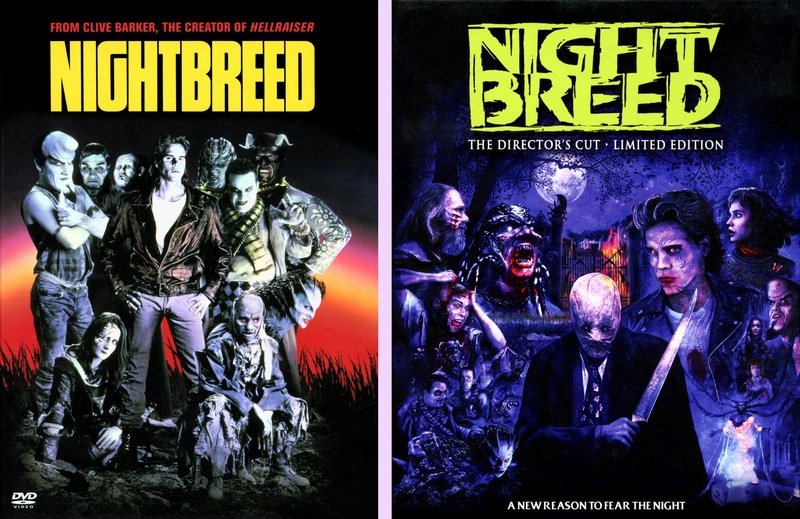 Clive Barker's Nightbreed: The Director's Cut - Limited Edition. 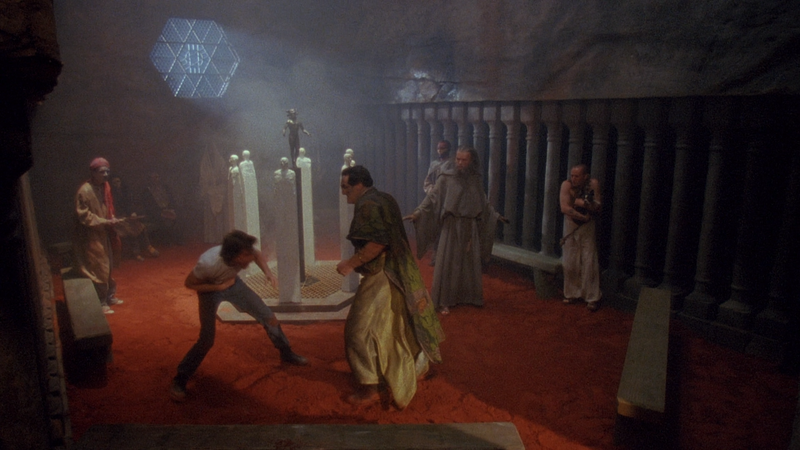 This is the one that really precipitated the whole Scream Factory Catch-Up in the first place. I mean, wow. It may not be the best movie Scream Factory has ever released, but it's got to be the most impressive work they've ever done for a film. 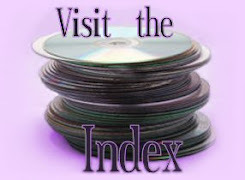 I mean, just licensing a catalog title from Warner Bros for a start - ha ha! 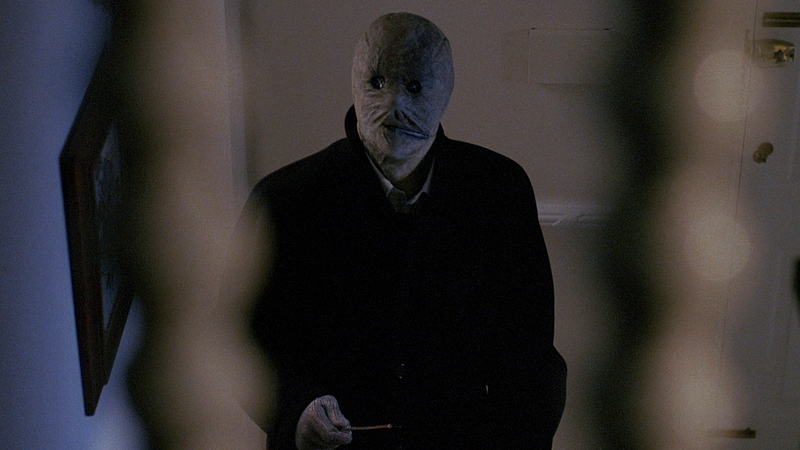 But seriously, they recovered the long lost footage of Clive Barker's original version, sat down with Clive, and had him personally reconstruct his director's cut, even getting Doug Bradley come in to re-dub his lines when necessary. Plus, you know, it's just the HD debut of the film in the first place, so we're getting a new HD scan of the theatrical version, and a massive collection of all new special features for a film that had (crazily) never had any extras with it before on DVD. This is like the utopian ideal vision of a special edition release. 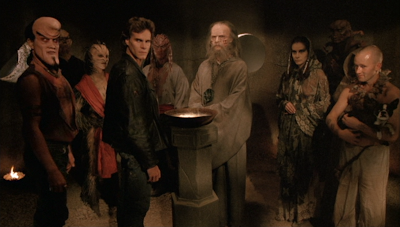 Now, when I said "may not be the best film," I didn't mean to imply that Nightbreed is a piece of crap. It's a very flawed, interesting film that probably plays better for dedicated Clive Barker fans than general audiences. But there's a lot to like here, including David Cronenberg as the mad slasher, cool matte shots and the colorful collection of weird supporting monster characters. The story's ambitious and doesn't cheap out on the thrills or spectacle. A man (Craig Sheffer) is troubled by memories of committing gruesome murders, which leads him to believe that he's secretly a literal monster and should live in a secret monster city hidden underneath a graveyard that he's seen in his dreams. Naturally, that place turns out to actually exist and it's a place you can just casually drive to. 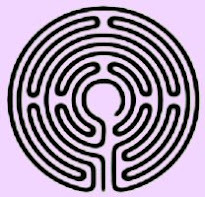 But everyone from the cops, his girlfriend to his twisted psychiatrist and a crazy priest are on his trail, and the resulting conflict could result in the end of the world, because those monsters also have an ancient tree god-type guy secretly ensconced with them... or something. So if you want bloodbaths, monster fights, crazy characters and a little originality, you'll find it all here. But you'll also find sloppy direction, lead actors who feel like they've been picked out of USA Network's talent pool, flaccid relationship drama, frequently bland photography and cloying attempts at cutesy humor. But the good stuff makes this at least worth at least one solid watch. I like that it's not afraid to get dark; giving it a little edge at times. Performances range from subtle and restrained to Hee Haw, which makes it hard to believe Barker had previously directed the much more refined Hellraiser. I guess this project away from him; after all, he's been famously unhappy with the version that was taken out of his hands, recut, screened and flopped theatrically. It's one thing to judge this version of the film, but we'd never gotten to see Barker's true vision... until now. 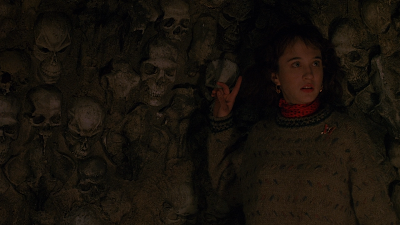 I'm really glad we finally got to see this film as it was originally intended; it's certainly illuminating, and it does cement some connections that were always a little tenuous in the theatrical version. But it may hurt as much as it helps. 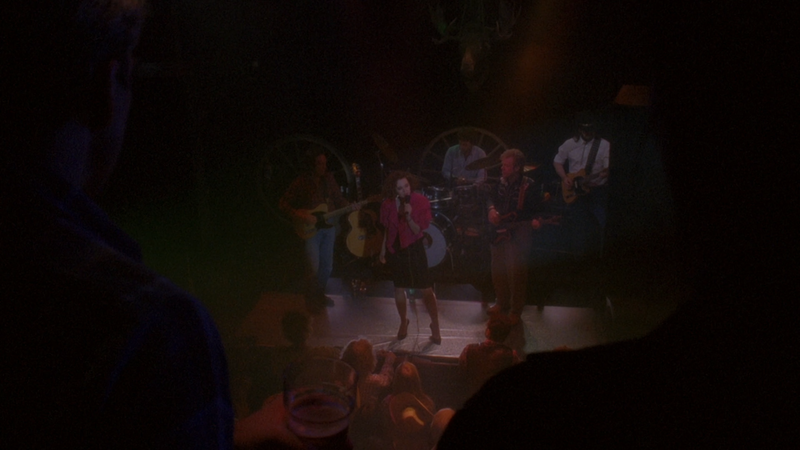 Is it really an improvement to stop the plot so we can hear Anne Bobby cover the entire "Johnny Get Angry" song in her nightclub? 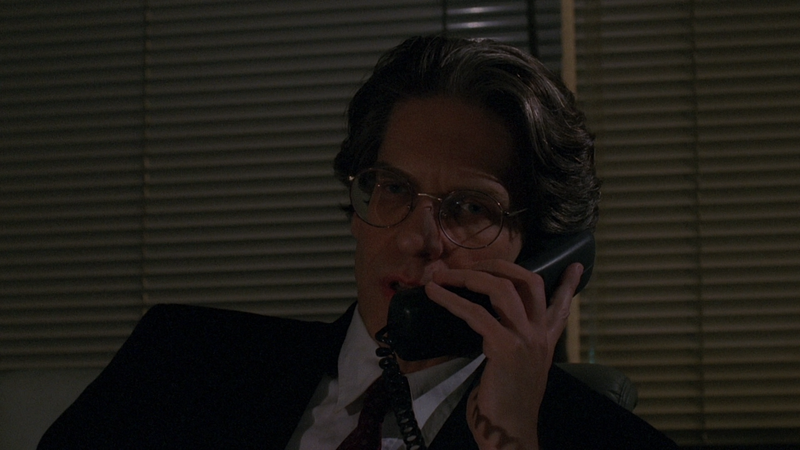 And some scenes between Sheffer and Cronenberg are said to make the latter's plans more explicit, but was anyone really unclear about what he was up to in the theatrical version? The restored scene of the police gearing up and gushing over their weapons is really goofy. And, frankly, I prefer the original, darker ending with Cronenberg's character, then the amended one in the director's cut. On the other hand, the director's cut has some neat stuff, including one I won't spoil with Cronenberg and the Narcisse character, and some line replacements are for the better. Personally, I'm not too convinced either cut is really preferable, but any fan of the film will definitely want to see both. Nightbreed has pretty much always been available from Warner Bros on a no frills DVD. It was widescreen, at least, but completely barebones except for the trailer. It eventually went out of print and up in price, prompting Warner Bros to reissue it in 2011 as an MOD DV-R in their Warner Archives collection. But I never even bothered with it, holding out for the special edition that was bound to eventually happen. I mean, even if the missing footage had never been recovered, it's still one of a very few Clive Barker films where he was able to direct his own work, and it's loaded with stuff to talk about. 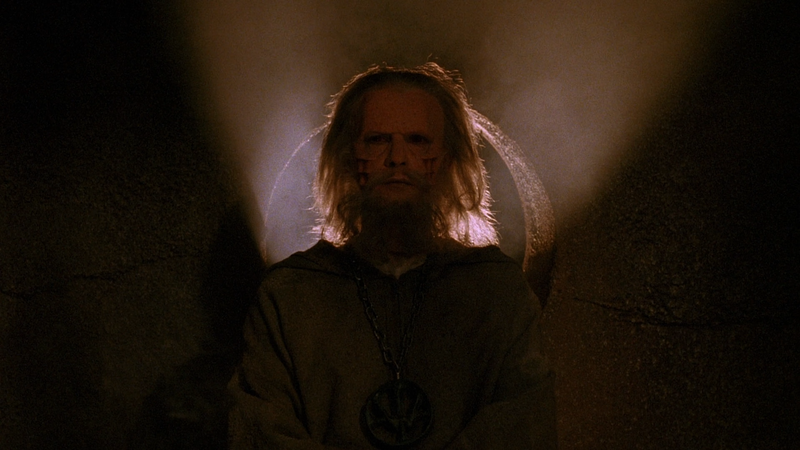 But it took the surfacing of the workprint tapes, re-edited into the Cabal Cut, to finally push the project into being, and Scream Factory announced their grand 2014 restoration. Then suddenly, whattayaknow, the original film elements came out of the woodwork, and now we have a beautiful, fully restored director's cut in HD. And they threw in the HD debut of the theatrical cut into the same set. 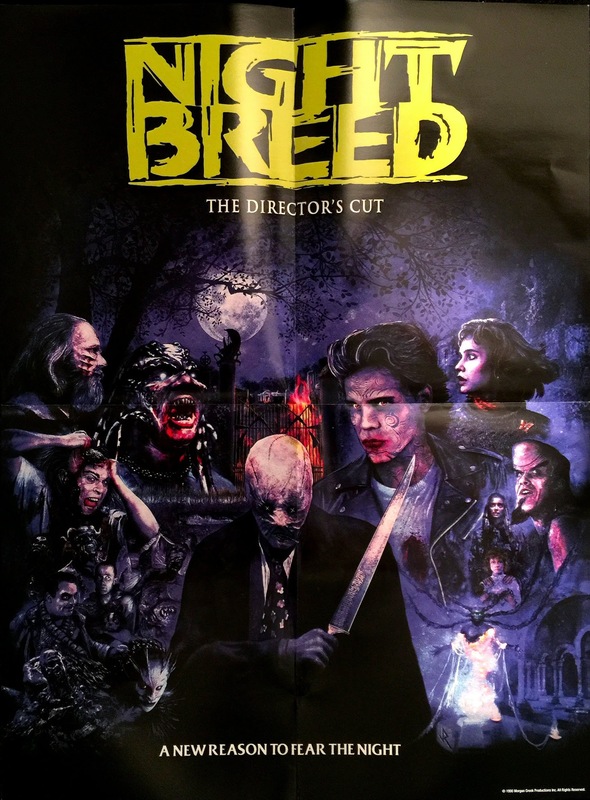 and Scream Factory's 2014 director's cut blu on the bottom. and Scream Factory's 2014 director's cut blu on the right. You might expect Scream's theatrical blu to look just like the Warner's disc but in HD, but no. They've done new scans for both versions. Even Scream's two cuts look slightly different when they share the same footage, with the director's cut looking ever so slightly more detailed with the most natural grain. The old DVD is paler (although considering how dark and low contrast much of this movie is, I could see a case for preferring the extra brightness) and much softer - more than just the difference between SD and HD - and the blu is redder. What's perhaps most interesting, though, is the framing difference on the DVD. Both releases list 1.78:1 in their specs, but the old DVD is really a slightly taller, pillar-boxed 1.76:1, giving it extra information along the bottom. The director's cut has mostly high quality sound, but some scenes' audio are sourced from the old workprint tape, and you can really hear the noise gate struggling against the hiss. 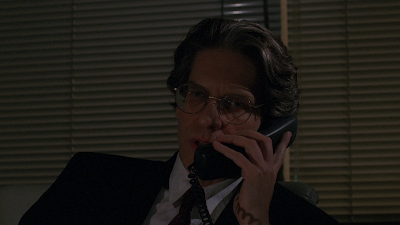 You only really notice it in a handful of scenes, however (like the restored Cronenberg's restored phone call near the beginning of the film), and even then they do a decent job of keeping it from becoming too noticeable. Warner Bros gave us the choice between a 5.1 mix and the original stereo mix, which Shout also does on their director's cut (but now in DTS-HD, of course), but they only have the stereo mix for the theatrical cut. All versions have optional English subtitles, though WB also threw in Spanish and French ones. I should point out that Scream Factory also released this has a two disc set, with 1 blu-ray and 1 DVD copy of the director's cut. But of course we're going to look at the limited (albeit to 10,000 copies, which is barely limited) edition boxed set, which is 3 blu-ray discs of both cuts of the film and even more special features on the third disc. And I've a few people say they felt Scream just left the filler for the bonus disc and all the best stuff was on the main Director's cut disc, but I disagree. 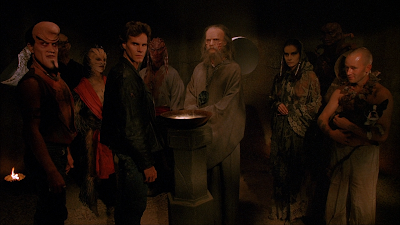 I actually found some of the more interesting stuff to be on the bonus disc, including a frank interview with the editor who re-cut Nightbreed against Barker's wishes and a cool look at some stop motion creatures that never made it into either cut of the film. Meanwhile, one of the "big" features on the main disc was a drawn out series of interviews with the cast where they were each asked to describe their characters, which wasn't terribly illuminating at all to anyone who'd already seen the film, and actually gets a little tedious. Still, of course, both versions have some great and crucial extras. There's an introduction and audio commentary by Barker, in-depth interviews with the effects team, 2nd unit director and stunt man, and that documentary I criticized in the previous paragraph, which did also include some good content with the cast. That stuff and the trailer are what's in both sets. 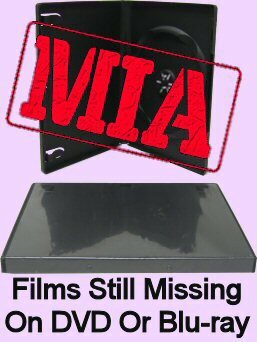 Besides the aforementioned looks at the stop motion and editor, the bonus disc also offers over 25 minutes of deleted scenes not included in either cut - including an interesting, unseen kill or two - some in full quality and others sourced from video tape. 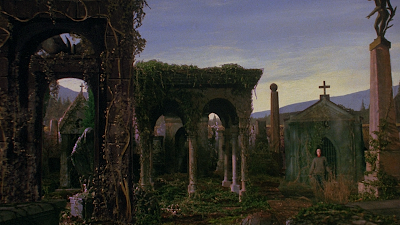 We also get a series of shorter featurettes looking at the matte paintings, makeup tests, rehearsal, artwork, and a more in-depth interview with effects artist Bob Keen (who was included in the effects piece on the other disc), including his behind-the-scenes footage. Plus, it's got like five stills galleries. The 3-disc set comes in two separate amaray cases, both with reversible artwork, housed in a nice, solid slip-box, which also contains a pretty lavish, 40-page booklet, telling the story of the Cabal and director's cuts. And if you were one of the first 3000 people to order it direct from Shout's website, it came with a large 18"x24" poster as well. 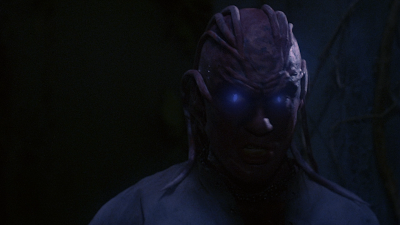 So yeah, I was never quite enough of a Nightbreed fan to big up the generic Warner Bros DVD, but I don't know what kind of genre fan you'd have to be to not be intrigued by this impressive set. If you missed this when it came out, I would recommend putting in the extra effort to get the 3-disc set, because I think some of the bonus disc stuff really is worth it, plus it turns out the director's cut invalidated the old theatrical version as much as many of us thought it would, so you'll want to have that on blu, too. This is one of my favorite films of all time. I love what they have done with the film and the special features are amazing. The one gripe that I have is that exclusion of some of the deleted scenes. I understand they were of a lessor quality, but it would have been nice to see them in any form. Excellent review for an excellent film.